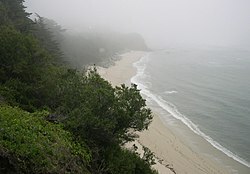 Due to the marine air currents off the Pacific Ocean, Moss Beach experiences above average fog levels, but also superior ambient air quality. Note the ever present fog in the photo to the right (the circular blotches are not a special effect, but a result of the droplets formed on the camera lens cover). 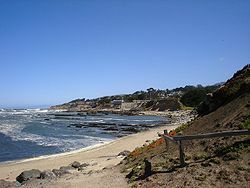 Situated along the coast of Moss Beach is the Fitzgerald Marine Reserve, a California designated area of Special Biological Significance. The reserve boasts a scenic blufftop trail through ancient cypress groves overlooking the Pacific Ocean, historically interesting tidepools and a variety of significant marine animals and pelagic birds. The unique outcroppings along the beach are part of the Franciscan formation, a favorite of local geologists. Montara State Marine Reserve & Pillar Point State Marine Conservation Area extend offshore from Moss Beach. Like underwater parks, these marine protected areas help conserve ocean wildlife and marine ecosystems. An occurrence of the rare plant Hickman's potentilla, Potentilla hickmanii was observed by E.C. Suttliffe in 1933 in the vicinity of the mouth of San Vicente Creek within Moss Beach. This colony was not further documented for decades, but another colony was discovered toward the end of the 20th century north of Moss Beach. The plant was listed as an endangered species by the United States government in 1998, and had previously been listed as California endangered in 1973. Off State Route 1, one finds the famous restaurant Moss Beach Distillery, an architecturally and historically noteworthy building located upon a cliff with ocean views. This present day restaurant has its roots in bootleg liquor during Prohibition. This building is an official California Point of Historical Interest  and includes its own ghost (the Blue Lady) which has been featured in a number of ghost hunting programs including Unsolved Mysteries. Sci-Fi's Ghost Hunters recently found their paranormal claims to be fraudulent by revealing that owners of the distillery have created various hoaxes simulating paranormal activity. Noted travel author Karen Brown operates the Seal Cove Inn adjacent to the reserve.